How do I list directions to my business? 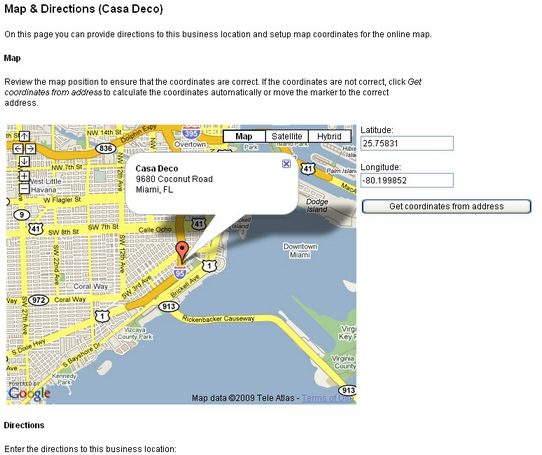 The Map & Directions page shows customers where to find your business. The location of your business is automatically calculated based on the address you entered on the Address page. You can also enter directions to your business location. We recommend that you describe the directions from major highways or intersections. This will make it easier for your customers to locate your businesses. To access the setup, navigate to Setup - Business Information - Map & Directions. 1. First, click “Get coordinates from address”. This will reset the marker to a geographical location calculated based on your address. 2. Inspect the map (zoom in if necessary). If the marker is a little bit off, just move the marker to the correct location. If you get the big white or blue background, simply enter the longitude and latitude of your business and the marker will be positioned correctly. Don’t have access to a GPS that can give you longitude and latitude? Don’t worry – just zoom out on the map, move the marker to a place near your location, zoom in a bit, readjust the marker, and repeat until the marker is at your exact business location.